The roof structures of the old manor complex at Halswell date from the many different phases of building. Roofing evidence from before the Tudor period has not yet been identified; we know there has been a manor here since at least Domesday times but the roof structures have not necessarily survived as well as the stone. From the early and late Tudor periods respectively we have the Great Hall building to the east, the south range and the two sides of the inner courtyard. It is this area of the roofing structures and their associated wood and stone repairs where this current phase of restorations focusses. The roof plans of Halswell, courtesy of Claire Fear of Architectural Thread Ltd. 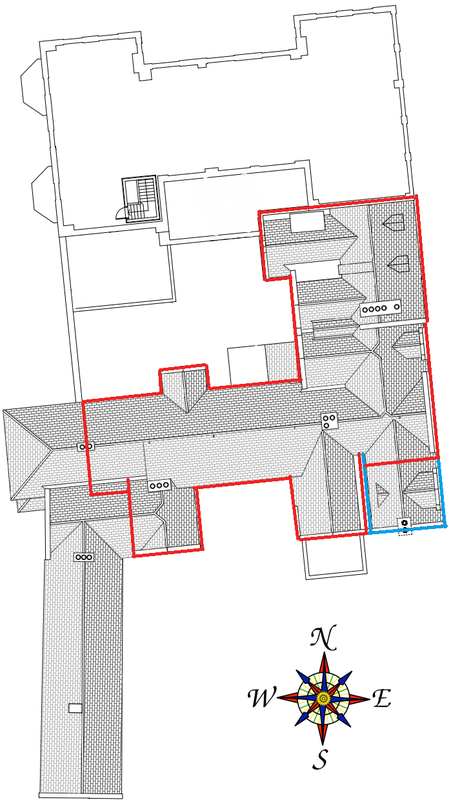 The areas highlighted in red correspond to the Tudor Great Hall, which takes up the northern half of the east range, the 1590’s south range and the three gabled additions to the Great Hall in the east of the courtyard. 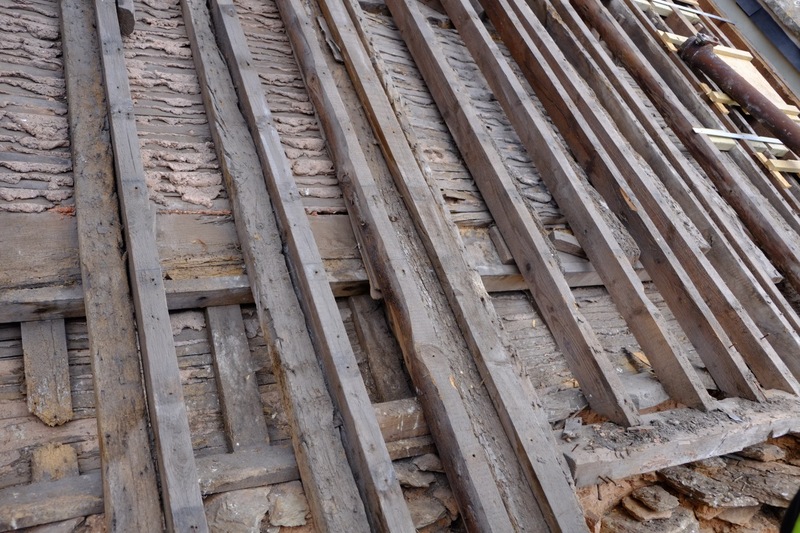 The sixteenth–century roof purlins and rafters are still doing their original job underneath later roof coverings. 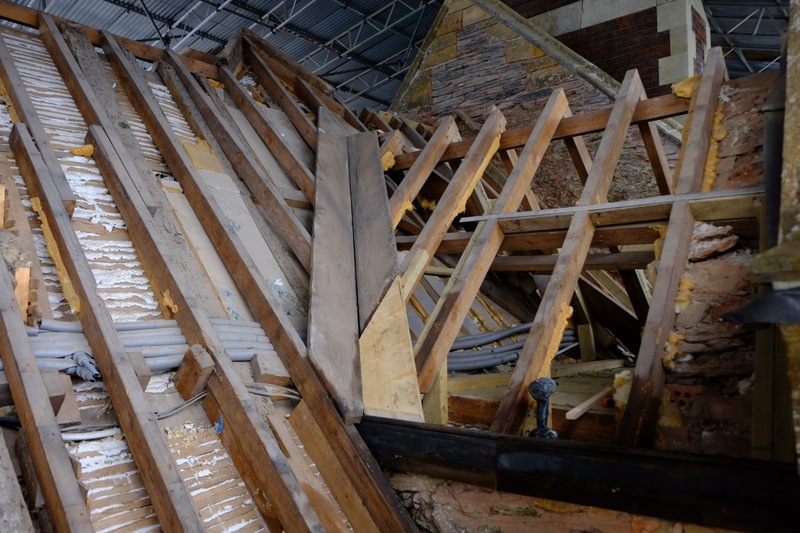 Later rafters (the horizontal timbers side-by-side here) were added over the centuries to strengthen the roofs and ceilings, much the same way that the current roof restoration is adding new timbers to the old where necessary. Photo taken from the south looking north; from the lower right, this photo shows the eastern gabled tower of the south range where that roof meets the chimney stack that served the1590’s kitchen, housed under the roofing on the left in this photo, which is the eastern section of the south range. Looking from south to north, this photo takes in the whole east range to the right and the eastern south-range gabled tower to the left. The thin and light coloured timber rafters are from the 1920’s roof repairs, the date the chimney stacks were re-built in brick above the roof level. Those timbers sit beside earlier rafters, below which are the much heavier original sixteenth century structural timbers. A new oak wall plate supporting older timbers on the c. 1900 gable, this is the east side and shows the stonework around the projecting mullioned window. 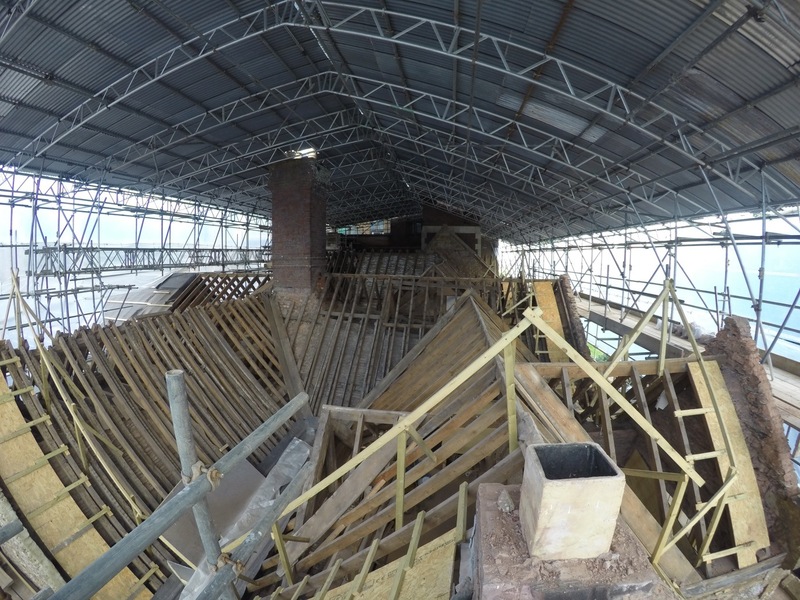 The below four images of the same area of roof show the progress of the re-roofing works. After the scaffolding roof was erected the thin and brittle 1920’s slates were removed. 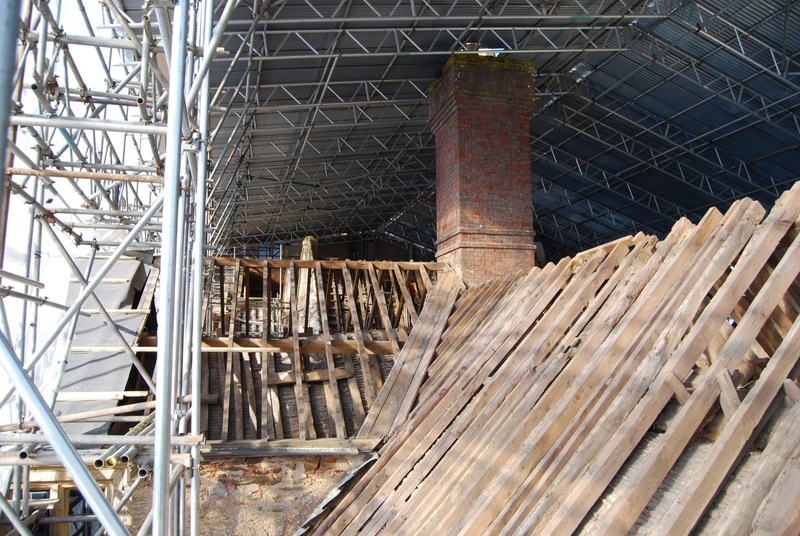 Once we were able to get inside the workings of the roof from above we could access rot and other damage to the historic timbers. Due to historic lathe and plaster ceillings in all of the rooms this could only be done from above. 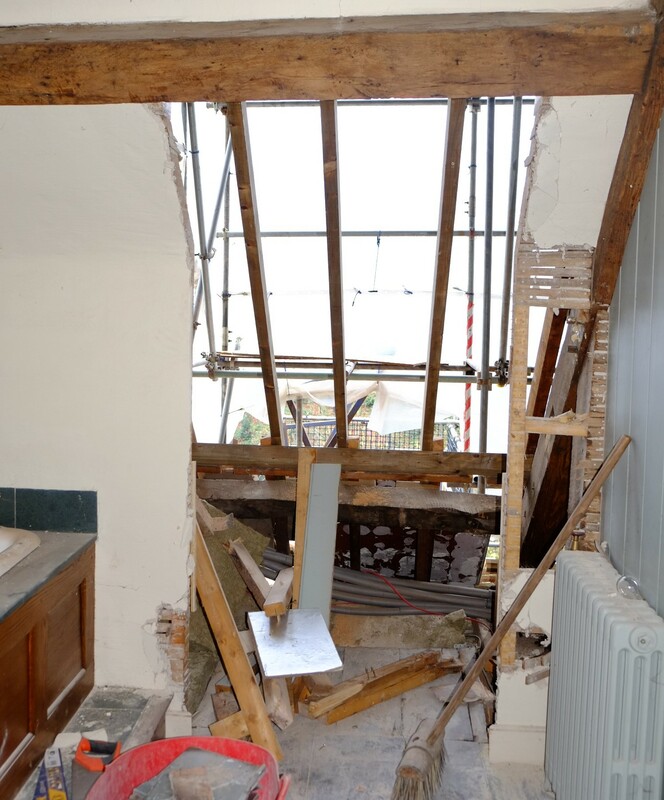 The worrying water ingress that was effecting many of the gullies and corners meant we needed to examine the sixteenth-century purlins, trusses, wall plates and even the small lathes holding the plaster ceilings in order to evaluate damage and treat it accordingly. 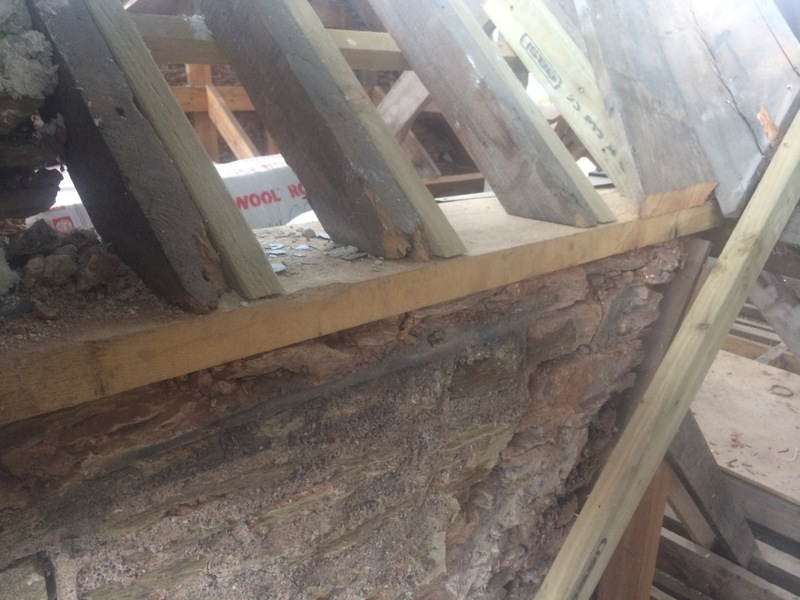 We were pleasently surprised to see that most of the historic wood was in servicable condition and the water ingress to certain areas had been caught in time to save the historic fabric. Howevger it wasn’t just the woodwork that we knew needed attention. The gable in the south east corner was structurally unsound, but in addition the southern gable the Great Hall builiding, though abutting another sixteenth-century phase of building, had a pronounced and decidedly unsafe bend to its gable. Only by removing the 1920’s slates could this assesment and restoration be carried out by our wood treatment specialists and stone masons. After the stonework, structual and decorative, had been repaired we moved onto renewing all the lead guttering and installing the much needed insulation. Different forms of insulation had to be chosen for the varying historic needs within differently built sections of the roofspace. As the slates had not been off since the 1920’s, perhaps unsurprisingly, Halswell had completely missed the twentieth-century revolution in building insulation! This much needed addition will to add to the long-term warmth and therefore the stability of the building’s fabric for generations to come. 1. 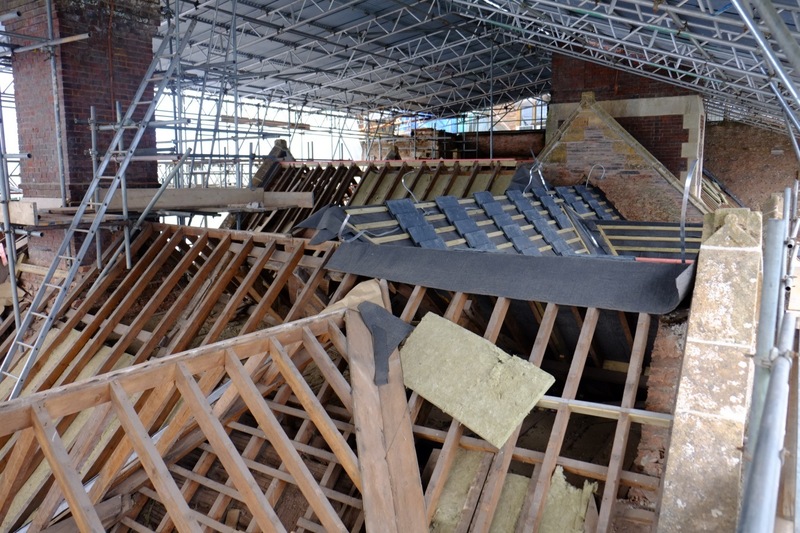 The gable straightened and restored and the wood and stone restorations complete, the voids between the rafters and the slates are prepared for insulation, felt and batons. 2. Insulation complete, the felt and batons are applied and the slates delivered. 3. 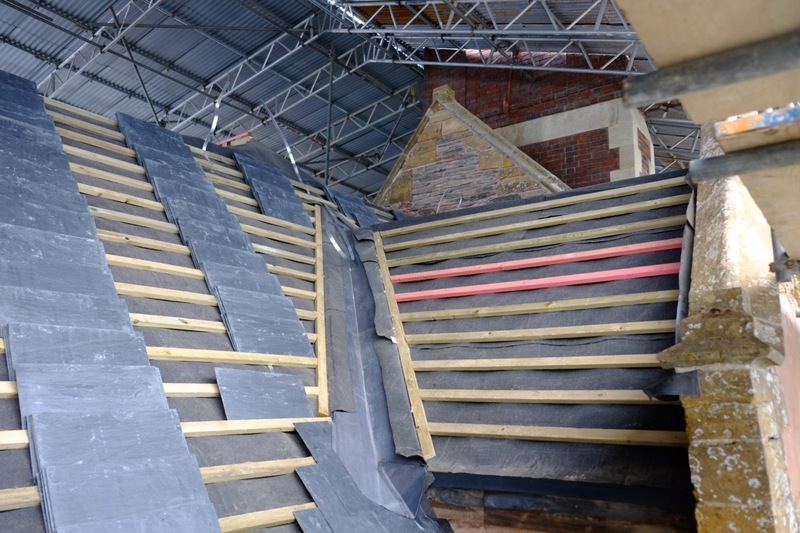 With the lead gullies complete and the protective lead layers embedded in the historic stone groves of the gables, the slates are ready to be hung. 4. 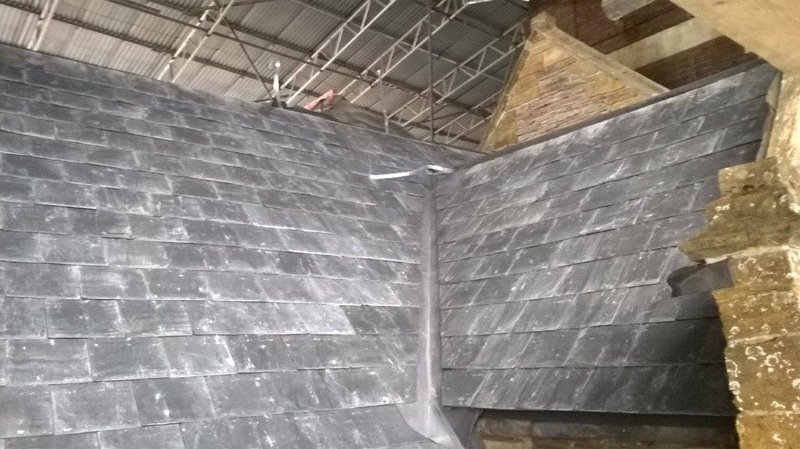 The finished product; beautiful lead-capped grey slates roofs over a fully restored, sealed and insulated structure. As crisp and long-lasting as the day these gables and roofs were first built nearly 500 years ago. The original Tudor master mason’s vision of how the buildings looked when completed is of the highest importance for the restoration of Halswell. To this end un-historic additions are rooted out where correct to do so. The Great Hall building is of first rate importance, not just by being a Grade 1 listed building, as all of Halswell is, but by being the most important existing phase of the old manor, which to a great extent exists in its original state. The roof of this part of the house has never had windows, however less than a decade ago his area was given two dormer windows. As useful as they may be for letting light into the top floor the insertion of two lightweight dormers to the third story of the Tudor Great Hall block was historically wildly off the mark. Halswell’s east range showing the Great Hall building in-between the Baroque house of 1689 to the north and the three gable ends to the south. 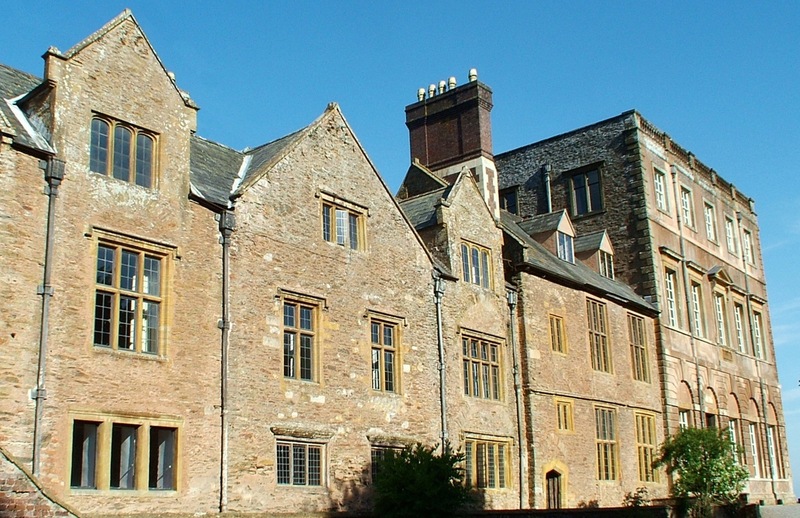 The two banks of large mullion windows in this early Tudor Manor building correspond to the Great Hall on the ground floor and the Solar (or medieval Lord’s quarters) directly above on the first floor. The same view with the addition of the dormer windows above the Great Hall and Solar. Though there are attic level stone windows throughout the old manor, this, the most important section, displays no evidence it possessed them and as such, both visually and historically, Edward Strachan decided that these must go. With the encouragement of Historic England and Sedgemoor District Council we have removed these later inclusions and are restoring the integrity of this, seemingly the earliest surviving, building in the old manor complex. This roof line of the Great Hall remained unchanged from early Tudor period until the early twenty-first century and bringing back that historic integrity was very important to the owner, the Halswell team and the protective heritage bodies who oversee all the works we do at Halswell. The removal of the offending modern dormer windows in the top floor of the Great Hall. 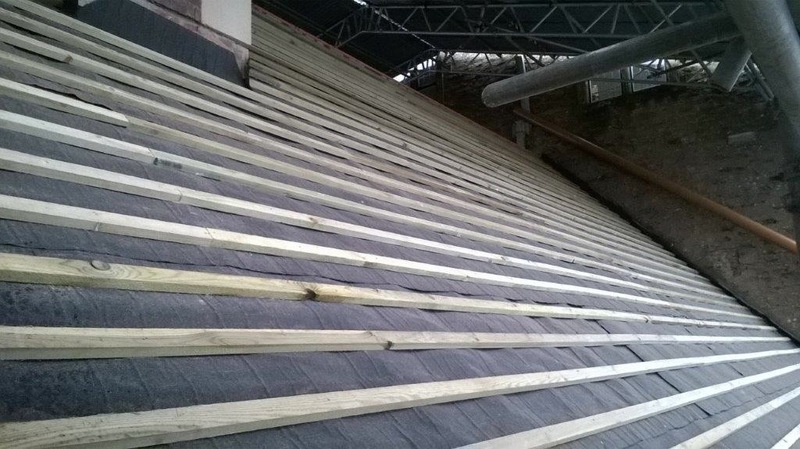 The same roof area with dormer windows now removed, ready for its final finish of slates. Excellent images. I have been trying to visit the roof at Edward’s suggestion without luck but these ‘photos will do v.well.